It was that Saturday in March whereby the weather completely forgets what month it is and fast forwards to Summer - a gloriously warm, clear day. Myself and the other half had signed up to a Mountain Explorer Experience with The Irish Experience. An eco, adventure tourism company founded and based in the Sunny South East. L-R Willy, Graham & me! The day started in a café of a service station in Lemybrien, Waterford. Here we met our guides for the day. Graham Doyle - owner of the Irish Experience - a ball of enthusiasm and energy, a clear passion for adventure and a bit of an adrenaline junkie. William Nolan – mountain guide, a wealth of knowledge and experience on all things mountaineering and climbing, an impressive resume of climbs and a really nice guy. A ten-minute orientation on what to expect for the day with the group (5 of us on this particular day) and then we were off up the road to park at the foot of the Commeragh mountains. The walk was going to take up and around the edge of the Coumshingaun lough. We each got a map and compass and Willy took us through some map reading skills so we could find where we were and the lay of the land and then off we went. Fitness wise I would say a moderate fitness level is required but we did stop frequently to take in the surrounding views and to do a little bit more map reading - leaving plenty of time to take a breather. Both Graham and Willy are passionate about the ‘leave no trace’ movement towards ensuring that the countryside should be left exactly as you find it – Eco tourism is a big part of what The Irish Experience is all about – this was evident throughout the day as they picked up and pocketed any bits of rubbish that they came across for proper disposal later. I have done my fair share of hillwalking over the years and I had expected that this would take me a bit out of my comfort zone – I wasn’t disappointed and to be honest I think I left the comfort zone back on the first steep bit of slope! As we got further up the mountain there were a few sections of scrambling – requiring both hands and feet to negotiate up the rocks. The section just before the summit is the toughest bit of the climb. The mountain is steep and there no room for overtaking. Willy reminded us to put our trust in our feet and they wouldn’t let us down. Despite the fact that the trail is narrow, rocky and steep I did take on what he said and it is amazing how quickly you build that bit of confidence in yourself when you know you have two guides with you as experienced as these two looking after you. 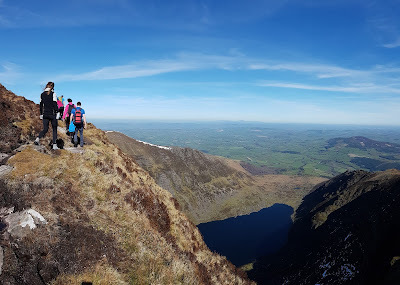 The views of the lake on the way up are just spectacular and you really have to remind yourself that you are less than a half hours drive from Waterford city and about an hour from Wexford. 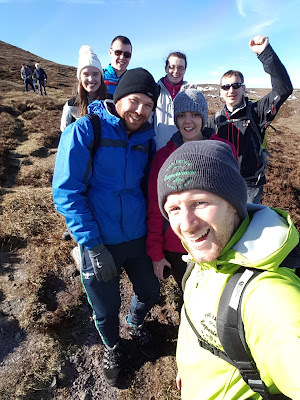 There were a few points where a helping hand was needed when my legs weren’t quite long enough to reach a grip and when we finally did reach the top there were smiles all around as we got to take in what we had just climbed and the spectacular views across Carlow, Wexford and Waterford. 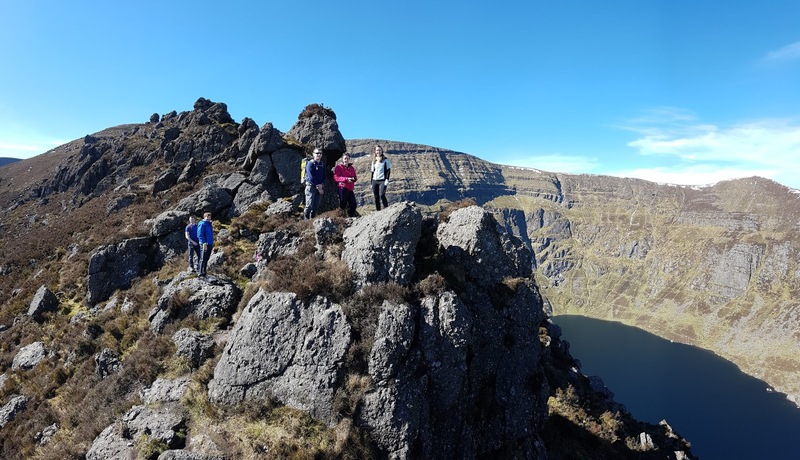 All the way up we had been learning how to recognise the different landscapes and terrains on the map, seen features you may remember from Geography in school and learned tips and tricks for making the most out of your hill walk. At the summit we found a sheltered spot and sat for lunch. Now, there is dining alfresco and then there is alfresco dining at the top of a mountain in the Irish countryside. What a view! We had packed our own lunch and this was added to by Graham who rustled up hot chocolate for everyone along with a flapjack - the most enjoyable hot chocolate I think any of us had ever had! After lunch we learned how to use the compass with the map, how to measure distance and some other things which I will look forward to putting into practice on my next outing. The decent down the other side of the lake was not quite as strenuous and the lads told us some local stories such as that of a man who returned from war and lived for 40 years in the mountains here as he couldn’t bare to be around people and the busyness of the towns. The whole loop covered about 7.5km and we completed it in about 5.5 hours and we had a bit of a sit-down and debrief once back at the carpark. As well as some fantastic photos, great laughs and a confidence boost we took away some skills that we can work on and develop for future adventures into the mountains! As the saying goes, ‘tell me and I will forget, show me and I will remember but involve me and I will learn’. 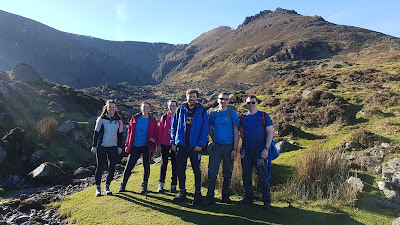 The knowledge, passion and genuine excitement at showing people this fantastic landscape and teaching them is a wonderful thing to witness and I would highly recommend Graham, Wille and the Irish Experience as a great way to get a foot out the door and into the surrounds of the South East countryside and coastline. A reasonable level of fitness would be recommended. Walking boots are a must and plenty of water and snacks. Graham sends an email in advance of the day with everything that you will need. Pricing: This particular excursion costs 59.95 low season and 79.95 per person in the high season, which starts on May 1st. Group sizes are small to ensure safety and enjoyment for all. The company was founded in 2016 by Graham. 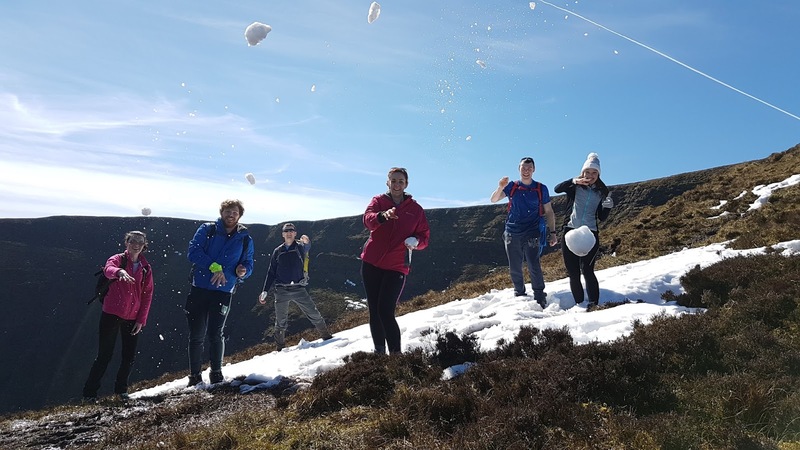 They are a Wexford based outdoor adventure company and as well as the mountain experience (which is new for 2017) they offer a range of outdoor activities including kayaking, stand up paddle boarding and coasteering in the stunning surrounds of the Hook Peninsula. Catering for corporate, private group, families, hens/stags and students the team are happy to work with you to ensure an enjoyable and memorable experience for all. So why do it? Why go up the mountains, out of your comfort zone, learn something new and enjoy breath-taking experiences? In the words of guide Willy Nolan “For those who understand, no explanation is necessary; for those who don’t understand, no explanation is possible”. Get out, join the Irish Experience and Make it Mór!